La Maison d'Angkor is a charming and intimate hotel where excellent value can be found without comprimising luxury. 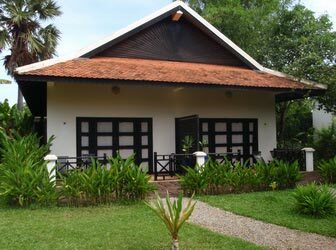 Fine surroundings with garden chalets built around the pool make this a very pleasant Siem Reap hotel. There are 16 rooms in this small hotel. Of the 16 rooms, 12 are deluxe rooms occupying 40 square meters, 8 of which have deluxe pool views and 4 of which have garden views from the balconies. Luxury double or twin beds and sofas are in the rooms. The hotel's garden is based on a Balinese style garden and is intimate and beautiful, with a luxury pool and relaxing ambience. There is also a jacuzzi and massage service, living room with library, restaurant and poolside bar. The swimming pool and garden are very luxurious. The small size of the hotel makes it feel especially intimate and relaxing. "Compare to huge hotels around, La Maison d'Angkor is a peaceful and beautiful place to stay. In a cosy and charming atmosphere, surronded by nature, rooms are either in private bungalows or small houses. Food is good and service outstanding. We've been there couple of times and we will return for sure!"